Ready for the Big Ride Along? The Gigantic Bicycle Festival 2015 is set to commence in August, but the excitement and buzz have already started. It is a wonderful event for Pacific Northwest’s annual summer celebration of bicycle culture. The festival goes on for two days with amazing, yet diverse forms of recreation such as live music, hand-built bicycles, visual & performance art, film, comedy, guest speakers, sculpture, and interactive installation pieces. 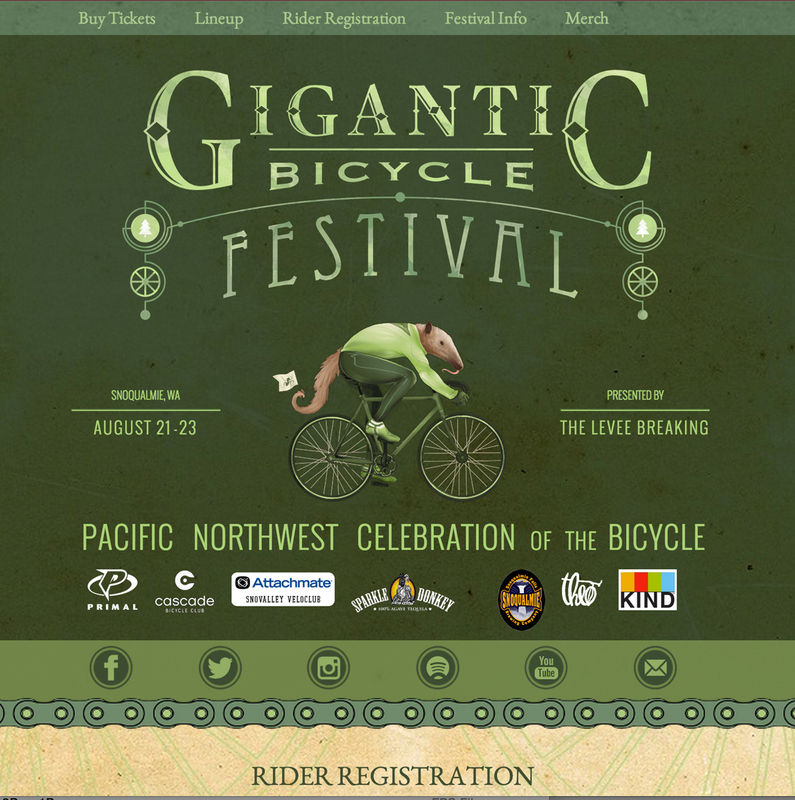 The 2015 Gigantic Bicycle Festival is held in Centennial Fields Park in Snoqualmie, Washington. A supported road bike ride departs from Magnuson Park on the first day of the festival, with riders arriving shortly after that. The weekend passes of the festival is included in the registration fees the riders need to pay for participation. They get free admission to all Bike Reels and Inky Spokes events, along with a full zip bike jersey with the Gigantic Bicycle Festival poster design. The rides are generally divided into two sections – 77 and 100 mile riders who are supposed to follow small spray painted anteaters who direct them about the turns and stops. For the 100 mile riders there were 5 stops while the 77 mile participants had 4. Each stop has mouth-watering goodies, and people wolf them up immediately! Gatorade, fruit, bagels, nut butters, granola bars, and chocolate filled tents – who can resist such temptation, especially when you are constantly moving your legs up and down? The music part of the festival is also interesting. There were tents showcasing hip and trendy bike products and giveaways as well as healthy on-the-go bike food, as mentioned before. There is usually one big stage where bands play for an hour at a time. In the past, Hey Marseilles, Menomena, Telekinesis, Moondoggies, have performed there, along with well-known local DJs. They mostly have rock and rock crossover bands due to the makeup of the crowd, which usually consist of bike enthusiasts rather than fans of music. This doesn’t mean the performances are not worth mentioning – they play catchy tunes and keep the audience entertained for hours. If you love biking and/or music, you should definitely come to this event from 21st to 23rd August. The transportation, camping, and registration costs are affordable, and quite easy on the pocket. But the popularity of this festival has skyrocketed, so you should get your tickets right away before they get sold out. Get ready for a weekend of fun, excitement, music, and entertainment.